Looking after your garden during autumn and winter couldn’t be easier with assistance from North Worcestershire Lawn & Garden Equipment, which offers a full range of top-quality machinery as well as servicing and repairs. 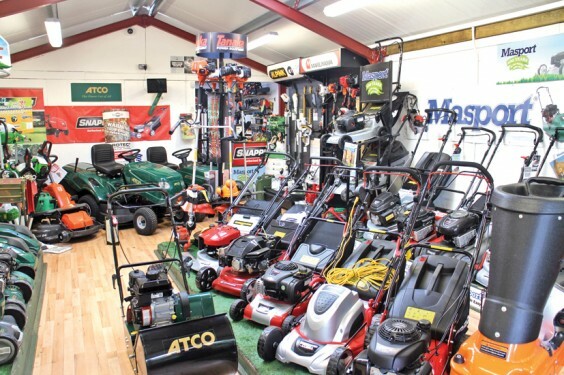 The family-run business, based in Tardebigge, provides an excellent before and after sales service, including expert advice on which mower is best for each customer and garden. The spacious showroom is able to display a large selection of equipment from leading manufacturers, as well as being able to source most items overnight. The range includes ride-on mowers, lawnmowers, chainsaws, hedge-cutters, log splitters, cultivators, safety clothing, consumables and spare parts. Owner George Richardson, who set up the business nine years ago, has built a great reputation with top brands, and NWL recently became a dealer for the Japanese-made Maruyama machinery. This boasts a five-year warranty and features lightweight brush cutters and an easy start mechanism. Also new in stock is the Italian brand Active, a range of brushcutters, chainsaws and hedgecutters. NWL is a service agent for a host of other well-known names: Atco, Gardenprice, Ochiai, Masport, Cobra, Allett, Alpina, Simplicity, Gardencare, Tanaka, Snapper, Billygoat and Briggs & Stratton. All machines come with “white glove service”, meaning the equipment is fully assembled and comes complete with fuel, oil, and a demonstration of how it works. NWL’s fully-qualified engineers can repair and service most makes and models of garden machinery, using only genuine parts. Choose from either on or off-site servicing, with collection and delivery available. Chainsaw chains can also be sharpened and made to measure while you wait, and the friendly team can also sharpen blades and re-grind cylinders. Call in to NWL to view the huge range of machinery, and take advantage of the winter servicing offer. Limited availability – book early to take advantage of this offer!